In a medium sized skillet, on the stove top, sauté sliced onions in olive oil over medium high heat. Once onions have started to soften, add wine to pan and let reduce by half. Transfer onion mixture to slow cooker and place chicken breasts on top. Add chicken broth, salt, pepper, paprika, garlic powder, Worcestershire sauce and fresh thyme to slow cooker. Cover and cook cook on low 4-5 hours. Remove chicken breasts from slow cooker and set aside to shred. Pour slow cooker liquid through a fine mesh strainer and discard solids. Reserve au jus for dipping. In a small bowl, combine melted butter, garlic powder and pinch of kosher salt. Brush rolls with garlic butter and toast under broiler, 2-5 minutes depending on heat of broiler. Watch closely so rolls don't burn. 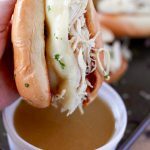 Pile shredded chicken onto toasted rolls and spoon a small amount of au jus over chicken. Place provolone cheese slices on top of chicken and return to broiler for another minute, or just until cheese starts to melt. Sprinkle sandwiches with fresh parsley and serve with a side of hot au jus.